Pain Physicians NY (Brooklyn, Queens, Manhattan, Bronx NYC) is one of the first practices in New York to offer an alternative treatment for neck pain. Depending on severity of the pain we might offer Platelet Rich Plasma (PRP) injections, laser interstitial thermal therapy, Pulse Stimulation Treatment (P-STIM), Electrical Nerve Stimulation therapy (tens therapy). We are Approved New York State Department of Health Medical Marijuana Facility. Our facility equipped with the most advanced, cutting edge equipment. Our Brooklyn neck pain specialists are best in region. We were selected to be a part of the international medical team for the Rio Olympic Games. The human brain and the spinal cord are normally protected by several layers which are known as meninges. Inflammation of these meninges is known as Meningitis. The swelling of these membranes triggers symptoms like pain, stiffness of the neck and fever. Inflammation can be caused by infections usually caused by viruses, bacteria, fungi or parasites. The treatment of meningitis will depend from its underlying cause. Bacterial Meningitis – is caused by bacteria like Streptococcus Pneumonia, a group B Streptococcus, and Neisseria meningitides. It is a very serious and even life – threatening infection which should be diagnosed on time and treated as soon as possible. Vaccines are available for the protection against some kind of bacterial infection. Viral Meningitis – is caused by viruses like Enterovirus, Arbovirus, and Herpes simplex virus. It is a serious infection, but however, it is less severe than bacterial meningitis. Usually people with a good immune system recover, on their own. Some vaccines for viral infections are also available. Fungal Meningitis – is caused by fungi like Cryptococci and Histoplasmosis. People usually get fungal meningitis while inhaling fungal spores. People with medical problems like diabetes, HIV and cancer are at higher risk of suffering from fungal meningitis than others. Parasitic Meningitis – Several parasites reach the brain and nervous system, causing infection. Parasitic meningitis is less common than bacterial and viral meningitis. Non-infectious Meningitis – is caused by several diseases like Systemic lupus erythematosus, cancer, head injury, drugs and brain surgeries as well. Severe headache which can be easily distinguished from other types of headaches. Sometimes even a rash, in the case of meningococcal infection. Crying even more when taken in lap. Viral infections usually occur in age younger than 5 years and bacterial infection in age younger than 20 years. People living in community settings are at higher risk of meningococcal meningitis. Pregnant women are at high risk of meningitis caused by Listeria. People with compromised immune system are at high risk. Alcoholism, diabetes, HIV and certain immunosuppressive drugs can compromise the immune system. Blood cultures are necessary in order to check the growing microorganism, particularly bacteria. Diagnostic X-rays and CT are also routinely performed in order to check the inflammation of the sinuses. Lumbar puncture is a procedure in which spinal tapping is done and cerebrospinal fluid is removed and checked. CSF in meningitis shows low glucose content and is whitish, with increased white blood cells and increased proteins. If not diagnosed on and treated on time, serious complications of meningitis may occur. Possible complications are hearing loss, brain damage, seizures, kidney failure, shock and even death. Bacterial infections are treated with antibiotics or with a combination of antibiotics, depending on the causative agent. Cortisone can be given to ensure rapid recovery. For viral infections, bed rest, plenty of fluids, over counter medications for symptoms of pain and fever are recommended. Anti – fungal medicines are given for fungus meningitis. 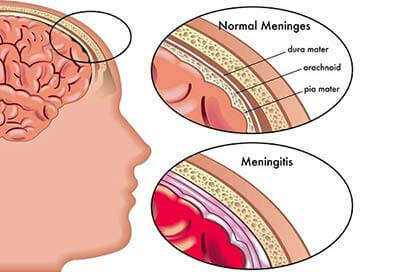 Other types of meningitis are treated according to the cause. The most advanced pain management center, Brooklyn neck pain management doctors and specialists at Pain Physicians NY offer unique, individualized approach. We are using the most effective neck pain management options utilizing the latest technologies available in USA.